This postcard with a Mansfield postmark was sent on the 7th July 1910 from Jack Smith to his mother, who lived in Boston Lincolnshire. Did Jack walk along this idyllic valley and enjoy the sound of the river and birds singing in the trees? Did he venture on and hear the noise of the Textile Mills which provided jobs for many people from Nottinghamshire and Derbyshire for a great number of years. Today  Pleasley Vale is still a pleasant place to walk, where the noise of the river and birds can still be enjoyed. The cotton mills ceased production a number of years ago, and for a while the area looked very forlorn and derelict. However the buildings have been refurbished and are now a Business Park. The Pleasley Vale Outdoor Activity Centre can also be discovered there. No doubt Pleasley Vale is still a place that attracts people from both Nottinghamshire and Derbyshire. I also worked at Pleasley mills from the 60s until redundancy in 1981. I remember Bernard Greenhalgh well. He arrived from Lancashire in the late 60s as No.1 Mill manager, and finished up as general manager of all three mills. I gained my first supervisor’s job under him and have fond memories of my time there, in fact I would probably have retired from there if it wasn’t for redundancy! I also remember Jack and Stewart Jones very well. (Hope you’re well Stewart). Pleasley Vale and its mills have always been an interesting sight to see,redolent of industry and power,and as you walk through there now,it is nice to see the vale busy again and the buildings being used.On a recent walk however I was quite surprised to see £500.000 plus properties built on the site of the former Vale house.The stone steps down from Pleasley Park will bring you out here to where the lodge houses are,you then can join the footpath beside the engineering work’s or go through the vale.I well remember the mill buildings standing silent in 1987 on their closure,the silnce in the vale where was once frenetic activity,the frames being hauled out to be sent abroad to more forward thinking economies than our own. I lived in Pleasley Vale at Gardeners Lodge, with my parents and 6 siblings. I worked in Mill 2 and my mum cleaned the offices and dad was driver for the directors and co. We had a lovely life there playing in the dam and the river, walking through to the Viyella Social Club where we did old time dance, on a Sunday watching them play cricket, life then was great. I met my husband there. sadly both my parents have passed away but I still go to the vale. I went to work in No 3 mill after l left the Co-op dairy in late 1973, I worked in the card room, you had large rolls of raw cotton that were called lapps, they were fed into the card machine that combed the seeds out and the clean pure cotton fed into something called a doff bin, when full it went to another department for spinning. It was busy work and good pay but it was very dusty and l decided after 6 months it wasn’t for me. I saw the mills many years later after they closed and it looked very depressing, I’m glad to hear they have improved these historic buildings. l hope one day to go back and take a look, the area sure was beautiful on a summers day. P.S Iam also interested in the history of the mills at the time my Grandfather worked there ( Bernard Greenhalgh) and also beyond. Anyone with any info, please add your comments. During WWII my father was a sergeant in the Royal Army Ordnance Corps stationed at Pleasley Vale, where some property owned by the mill company had been requisitioned by the army as storage for military equipment. During the summer holidays of 1943 and 1944 my sister and I came to stay in the Vale as guests of a family called Yeomans, who lived in a terrace of houses not far from the mills. The Yeomans’ had a son called Russell, a similar age to myself, and some time later he came to stay with us at our home in Manchester, and I was able to introduce him to cricket at Old Trafford. I have often wondered what Pleasley Vale is like now, and whether any of the Yeomans family are still in the area. I would love to make contact with anyone who can supply any background to all this! I used to work in the mills from 1976 till they shut down and I have really fond memories. I loved it….so sad now when I take a walk down there with the dogs, I made so many friends there I often think about them. You can walk through, and with a pass or info about a relevant business, you could possibly get through via the tannoy. 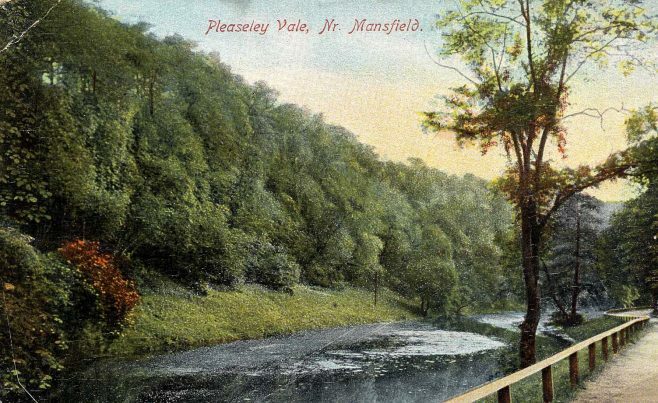 I remember Pleasley Vale well, in sunshine and shade, and have had some tremendous adventures and fun times down there. Glad to see the former mill buildings back in use. Surprised to see how vale house had been rebuilt, this occupies a prominent site and was possibly too far gone to be renovated. The caves behind contained prehistoric remains at some point I once read it had a tennis court at the rear too. I am now 42 years old and have lived on the nearby estate of Bull Farm not far from Pleasley Vale, as a child we had many great days down the vale, building swings across the river, fishing in the river, even swimming in the nearby stone quarry when it was flooded. The mills were not in use then and did look a real eyesore, but now that the business park is open it looks a lot better, I just find it a shame that you cannot drive through from woodhouse to pleasley and enjoy the scenery and reminise what it was like when I was younger. (now there are barriers at each end of the vale) is there a reason for this and can you walk through?